With Southern California’s snow pack hovering around 100% of normal, Kern River rafting enthusiasts now are waiting for melting snow to turn to whitewater. In April, Kern River Outfitters will host their annual Whitewater School. The school is a six-day course designed to teach the basics of being a whitewater rafting guide. “It’s essentially a six day interview,” says Kern River Outfitters general manager Keith “Luther” Stephens. Stephens projects that this year’s whitewater school will face challenges not seen in recent years. The above average snow pack means water will be higher and faster than usual. Participants will have to learn more quickly, or face an accidental cold swim in the river. “On the bright side,” Stephens muses, “this year’s class will probably yield some outstanding river guides.” On the river, nothing is a better chalkboard and teacher than nature itself and the whitewater class of 2010 will learn this better than anyone. 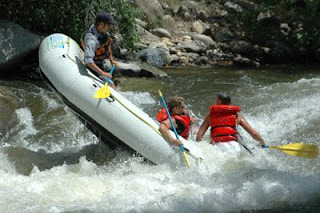 For more information about Kern River Outfitters 2010 Kern rafting season please visit their website at http://www.KernRafting.com. For additional information about becoming a guide for Kern River Outfitters, call them at 1-800-323-4234.